Did you try and check your email before stumbling upon this article? If so, how’s your mood right now and after that? Is there any way it affected your productivity? I bet you nodded. We’ve all been there, you just need to know how to deal with it. Email is one of the most vital communication medium that people, particularly business people, use and rely on today. 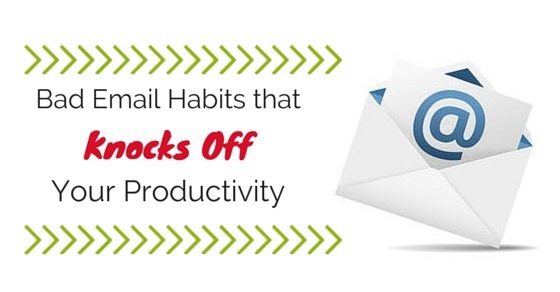 Reading, receiving, creating and sending emails can be both frustrating and overwhelming. But that doesn’t mean you have to make email your life. Unless your job is particularly checking emails constantly, you should not spend too much time in your inbox. People check their emails constantly and most of the time, they start their day logging in and checking their emails. Soon enough, it’s already your lunch break and you haven’t crossed-out anything on your to-do list yet. Folks, don’t let it take over your day. Since you’re sending messages, it’s only expected (more or less) that at least in a few moments you’ll receive a response. Hence, you find yourself spending more than an hour playing ping-pong email, shooting and receiving emails nonstop. Thus, your work tasks for the day isn’t at all accomplished. To avoid this, set a window time when checking your email — in the morning, after lunch and before you head home. By doing so, you won’t get too distracted and you’ll be able to finish more tasks. For sure some of you are guilty of this. “Message” and “Documents” isn’t an informative subject line, just so you know. Not to mention those who send messages WITHOUT a subject (not cool, bro). The primary purpose of a subject line is to provide a summary of the main message or the body of your message. It should be clear and concise. Companies, business owners, business people and working individuals receive tons of messages daily. In order to have your message prioritized or get it to be opened first, convey your email itself in the subject line. Get it straight. For instance, if your photoshoot needs to be rescheduled, type in “Photoshoot cancelled – new schedule” and then state the other details in the body of the message. You’re just composing an email, not writing a novel. If it’s possible to deliver your message in a short, simple and concise manner, do so. Remember, if you yourself receive a handful of emails, your recipient do as well. People have short attention span and if your email is too long and more so unimportant, don’t be surprised when you don’t get an email back. Use a clear format and a pleasing typeface that isn’t distracting. Make your email an easy and quick-read — straight to the point. They’re not really that interested with how your weekend went, unless they asked. If it’s more practical and logical to use bullet points then go ahead as long as it points out all the significant information needed. Remember: KISS — Keep. It. Short and Simple. Sure you compressed your initial five-paragraph message into one paragraph but does it contain all the vital information? If you can simplify your message, manage to include the most important parts and do not leave out critical points. If you’re announcing an event or meeting, determine; What (the event), Where (the venue of the event), When (time and date of event), For Whom (the target audience or target department)/Who (who will be conducting the meeting or who will be the speaker) Why (what’s it about; provide an idea what it’s for). Don’t reply with a vague “Yes/No” to someone, elaborate it. Your recipient isn’t a mind-reader so accomodate as much content that your recipient doesn’t have to scroll back to your previous conversation and/or confirm anything that’s already been discussed beforehand. Two words: Be concise. Sure your yoga class is important, but your seminar/meeting is a million miles far more important than that. If for instance, you receive your yoga class invitation and seminar invitation at the same instant and the event is scheduled for the same day as with your yoga class, classify and wisely choose which one needs to be prioritized (seminar/meeting, obviously). Not each and every single email you receive demands to be responded right away. Filter your messages and determine which ones are of greatest importance you should attend to immediately. There’s a reason why they have not responded to your query yet. Maybe they know how to prioritize and your email just happens to be seen as a ‘non urgent’ matter. Plus, shooting a follow-up email wastes your time as well, so better prevent yourself from doing it. Just like you, your recipient is busy. Maybe they read the email at the wrong place and at the wrong time so they couldn’t respond immediately. Or it could be that they are not sure of the appropriate information to reply with your query since they’re not in the office. There are more than 99 reasons why they haven’t responded yet so give them the time they need. If your recipient is prepared and ready to respond, they will. So learn to wait patiently. If you find yourself guilty for doing one or two (or maybe ALL) among these bad email habits, stop it now. There’s no better time to avoid doing these but now. When you arrive in your office, remind yourself not to dive too deep into an ocean of emails — only check them when needed. Focus and determine what is urgent and important. Author Bio: Chie Suarez is a resident writer for The Fordham Company, one of Australia’s top celebrity management companies and a major celebrity speakers bureau. Chie Suarez provides tips and hacks in personal and career development for those who are afraid to step out of their safe zones.